Family owned businesses and farms have long been the backbone of America’s economy, with small businesses continuing to provide a large portion of the nation’s new jobs every year. Our country’s farms are among the most productive anywhere on earth, and feed not only the people of the United States but citizens of many other areas of the worlds as well. Together, these small enterprises represent the type of legacy that deserves to be protected for future generations. What challenges do family-owned businesses and farms face in California? Are there legal tools that can protect my family-owned business or farm? How can a California estate planning attorney help me protect my family-owned business or farm? Many Americans don’t really appreciate the hard work and sweat equity that goes into operating a small business or farm. They see only the bright side – the opportunity that your business enterprise provides for you to create real wealth to benefit you and your family. They see that you have the potential to pass wealth on to your heirs. What they never really see is that sheer volume of threats that your business or farm faces daily. As an entrepreneur, your business is always a prime target for litigants looking to make a quick buck. That’s true of farmers as well, since their properties are frequently the object of legal action of one kind or another. Creditor claims can pose a risk as well, including unexpected claims. Taxes are always an issue. The United States has one of the least friendly tax regimes in the industrialized world, and many of the taxes levied on small businesses and farms can sometimes seem as though they’re intentionally designed to limit profitability. Your death or incapacitation can always be a threat to the company. It can make succession a messy affair, and could lead to high estate tax obligations if you haven’t properly prepared your estate to deal with such concerns. These threats can pose a serious risk to the financial well-being of your company and put your financial legacy in immediate danger. A California estate planning attorney can work with you to minimize these risks and provide your company or farm with the protections you need to get the peace of mind you deserve. The good news is that you can address these concerns with sound estate planning and business planning that focuses on securing your business interests using the proper structural strategies, protecting your assets, and arranging for a well-conceived and orderly succession. The plan and tools used for your strategy will depend upon a variety of factors, including the overall value of your business or farm. Specific business structure changes. The legal structure used to define your business ownership can have a dramatic impact on taxes, how well your personal assets are protected, and other important concerns. Your attorney can consider the various options available to you to ensure that you’re using the right business structure for your needs. Using trusts to secure assets. When your business assets are unprotected, they could be vulnerable to potential litigation, creditor actions, and other threats. You can minimize that risk by using trusts to hold company assets. This can reduce tax liability and the risk of asset loss, while positively impacting asset transfers. Succession should be a vital concern for any small business or family farm. None of us live forever, and eventually the company will need to be passed on to the next generation. Without the right plan in place before you die, your business interests could end up in probate for years – and that would interfere with operations to the extent that the business could be lost. You should create a workable plan for succession while you’re still alive and healthy. After working so hard to build a business legacy that you can pass on to your loved ones, you don’t want to see everything fall apart because you failed to create a plan to ensure continuity of your operations. Many small businesses and family farms have been lost to procrastination and a misunderstanding of the risks that are involved. By reaching out to our California estate planning team, you can ensure that your company or farm is well-positioned to survive any challenge. The choice is simple. You can leave your family-owned businesses and farms to the whims of chance or take steps now to seize control of your family’s destiny. 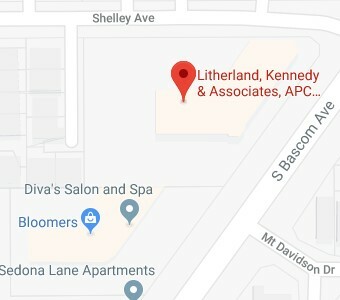 At the Litherland, Kennedy & Associates, APC, Attorneys at Law, we’re ready to help you be the master of your business fate with sound estate planning advice that meets your personalized needs. Contact us via this website or call us at (408) 356-9200 in Campbell or (831) 476-2400 in Aptos today.